The leader of Hong Kong's Occupy Central pro-democracy movement has announced the launch of a mass disobedience campaign. 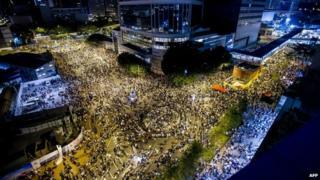 Benny Tai addressed thousands who had gathered outside government headquarters in central Hong Kong. It comes a day after the arrests of more than 60 protesters who had entered a restricted area on the same site. Mr Tai, a co-founder of the Occupy Central movement, announced the launch of a campaign to blockade the heart of Hong Kong's financial centre, in a surprise announcement on Saturday. The launch was originally due to be announced at the start of next month. Saturday's demonstrations were joined not just by students, but by many others, BBC Hong Kong correspondent Juliana Liu reports. The numbers swelled from the hundreds to the thousands, with police closing roads surrounding the area and urging demonstrators, especially minors, to go home, she adds. Many of the protesters came dressed in ponchos and eye protection in case police use pepper spray to disperse the crowds, as they did on Friday night. Nearly 30 people were hurt in Friday's scuffles at the popular protest spot at government headquarters, to which access has been restricted since July. Occupy Central says pepper spray was used without warning, and has condemned the use of "unnecessary force" against "peaceful protesters". Police said they made 61 arrests on Friday, including prominent student activist leader, Joshua Wong. School and university students have joined the protests in recent days, boycotting classes this past week. On Thursday, about 2,000 university students held a night-time protest at the house of the Hong Kong leader, Chief Executive CY Leung. The students' boycott was planned as a prelude to a larger demonstration due on 1 October, organised by Occupy Central. Hong Kong operates under a "one country, two systems" arrangement with Beijing, which means citizens are allowed the right to protest. In August, Beijing decided that candidates for the 2017 chief executive election would first have to be approved by a nominating committee. Activists have argued that this does not amount to true democracy.